In the course of researching my next book, I traveled last July to the all-American town of Fort Meyers, Florida, located just off the Gulf of Mexico a few miles up the Caloosahatchee River. I stayed at a Holiday Inn overlooking the river, and while browsing about the hotel’s recreation area I met a nice family from Scotland who regularly take their summer vacation in Florida. The war over the Falkland Islands had just ended, and out of politeness I mentioned the British victory to the young Scottish couple and their son. The man immediately became excited and exclaimed, “Yes, we showed them, all right! We beat them. We had to beat them, because we were fighting for a true cause and they didn’t know what they were fighting for.” The man’s son tugged at his father’s shirt, trying to get him back to their Ping-Pong match, but the Scotsman continued glorifying the British victory, emphasizing the high ideals that had motivated the British soldiers. The underlying psychological cause of such nationalism is simple: human beings (and, indeed, animals, birds, fish, and insects as well) are naturally inclined to live together and seek their fortune as a united group. A united ant colony quickly rebuilds its anthill metropolis after a rude foot has kicked it down. A united herd of elephants can defend itself against a lion’s attack. A united human city works harmoniously and becomes prosperous. And a united country presents a strong and influential image to the world. If a spirit of unity binds together most species of life, what distinguishes the human spirit of unity? Human beings stand out for their ability to perceive the greater oneness of all life forms and, indeed, of life itself. Ultimately, a human being’s sense of unity can extend beyond the material platform to the transcendental realm of God consciousness. By recognizing everything to be part of God, a human being can see the oneness of all existence and the dependence of everything on the Supreme Being. But the way modern nationalism unites people is by dividing them into superficial, temporary, conflicting political units. Nationalism demands that we abandon our real spiritual identity and unity and instead fight like dogs and cats. Since conflicts of interest between nations are endless, nationalism can never be the basis of lasting peace, which must stand on a superior awareness of the oneness of all life. Krsna consciousness teaches that all life is one because all living beings are part and parcel of Krsna, or God. The social system that grows out of this understanding is called the varnasrama system, and it organizes people into efficient and enlightened communities and societies with the Supreme Personality of Godhead at the center. 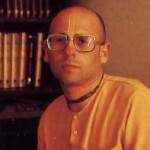 The Krsna consciousness movement seeks to establish such social units, in which everyone can learn to love Krsna without conflict of interest. Whereas nationalism flourishes by whipping up hatred for “the national enemy,” varnasrama flourishes by cultivating love of God and compassion toward all creatures. In my travels through Latin America I have seen that a corrupt government will sometimes create frenzied anti-American feeling so that the local people won’t discover and lynch the corrupt local leaders themselves. On the other hand, Americans often maintain an idiotic stereotyped impression of Latin America that serves only to gratify false North American pride. Thus nationalism easily becomes a tool for political exploitation and indeed creates spiritual darkness, hatred, and violence among those it supposedly inspires. Still, one may argue, political organization is a necessary evil, since power exists and must be exerted in a rational and orderly way. Civilizations must have a common identity to function efficiently. Different groups of human beings, despite their ultimate spiritual oneness, have distinct cultural and psychological patterns and thus will naturally group themselves together as separate peoples, nations, states, and communities. We agree that although God consciousness is necessary for man—and, indeed, is the goal of life—we cannot abolish the natural tendency of people to organize themselves into political and cultural units and to rule themselves or to allow themselves to be ruled by various political systems. But in every politcal system God consciousness must always be central. Only then can we avoid the conflicts that arise when mere political or national pride is vulgarly substituted for genuine God consciousness as the ultimate process for uniting people. Recently Psychology Today ran an article called “Our Pets, Ourselves,” which reported the latest scientific findings on human-animal relationships. Psychologist Randall Lockwood of the State University of New York at Stonybrook has shown that most people consider a person walking a dog more sympathetic and friendly than a person who is not. Apparently, Americans love their pets, and they actually recover from dangerous heart conditions and live longer when they confide in their pets and, indeed, pet their pets. The love Americans have for their pets certainly contradicts Western theology’s ghastly contention that animals have no soul. Is it actually possible that tens of millions of Americans are hugging, coddling, petting, kissing, and confiding in furry bags of molecules and atoms? Is the affection a pet shows for its master merely a chemical reaction? And if so, why don’t people hug and kiss bottles of chemicals instead of pets? Why do we consider someone a good person because he protects a pet? On the other hand, if animals do have souls and certain animals are lovable, why then do we brutally slaughter billions of other animals simply to satisfy our demoniac desire to eat meat? Why do we tolerate the blatant hypocrisy of a huge American cattle industry side by side with an American Society for the Prevention of Cruelty to Animals? In the first segment of this column we explained how nationalism is based on the hypocrisy of loving one’s own countrymen and looking upon others as enemies. There is certainly a similar hypocrisy in our mindless coddling of certain animals and our heartless slaughter of others. The lack of a scientific understanding of life, the soul, God, and God’s laws has created an unbearably hypocritical and demoniac culture in our country. 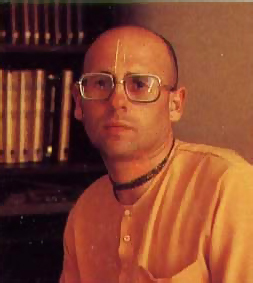 Perfect knowledge of Krsna consciousness can clear up our ignorance of spiritual matters and help us build a more consistent and enlightened society. 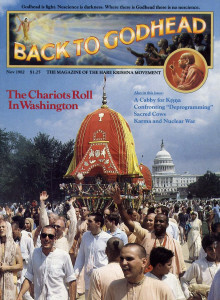 Unless Americans begin to appreciate and understand Krsna consciousness, which teaches scientific knowledge of the soul and God, the stunning and immoral contradictions of our society will ultimately destroy us.